Fr. Scott Pedersen was born and raised in Stuart, FL and received a call to full-time vocational ministry at age 16. He received his Bachelor of Arts in Religion at Palm Beach Atlantic University in 1989, West Palm Beach, FL. While working on a Master of Divinity at Southeastern Baptist Theological Seminary, he served as youth pastor at Knightdale Baptist Church, near Raleigh, North Carolina. Upon graduating in 1992, he served as Senior Pastor at Temple Baptist Church, near Statesville, North Carolina. He later moved to Atlanta, Georgia in 1997 where he met and married Dawn in 1999. He worked as a Teaching Pastor and missionary, working with inner city homeless and poor, at the Downtown Atlanta Vineyard. During their time as missionaries, they felt a strong call to plant a Vineyard Church in Greenwich, London, England and moved there in 2000. Their daughter, Kara, was born in 2002. While in England, he finished his Doctor of Ministry at Fuller Theological Seminary, Pasadena, CA in 2003. Fr. Scott sensed God’s call to raise up a pastorally gifted British couple within the church to take over leadership and move with his family back to the United States. He was the Lead Pastor at a non-denominational church, in Visalia, California from 2005-2010. He has also worked as Adjunct Professor at South London Christian College, London, England; Fresno Pacific University, Fresno, CA; and at Azusa Pacific University, Azusa, CA. Fr. Scott’s first liturgical experience was at a Via de Cristo weekend, the Lutheran version of Cursillo, while in University in 1988. In seminary in 1993, Fr. Scott further explored liturgical worship while studying Dr. Robert Webber. However, it was his positive influence by the Church of England, while living in the UK, which led Fr. Scott to further study, explore, and develop a deep appreciation and love for Anglicanism. After sensing God’s call to the priesthood in the Anglican Communion, Fr. Scott began his journey into Holy Orders in 2010 and was ordained a Deacon in May 2011. He and his family moved to Tustin, CA in July 2011, for a transitional period, where Fr. Scott worked with Todd Hunter, Pastor of Holy Trinity Church and Bishop of Churches for the Sake of Others (C4SO). Fr. Scott served as Assistant Pastor at Holy Trinity, Clergy Formation Advisor for C4SO and Executive Director for Telos. He was ordained a Priest in November 2011. God called Fr. Scott in October 2012 to be the next Rector of All Saints Anglican Church, Long Beach. His family moved to Long Beach and he started on November 26, 2012. Although born in Long Beach, Deacon Jim has lived in the San Fernando Valley for the majority of his adult life. He currently resides in the city of Tarzana. He came to All Saints from Christ Our Savior, Torrance in 2016 to further explore his call to Holy Orders. He was ordained to the transitional deaconate by Bishop Keith Andrews in August of this year. 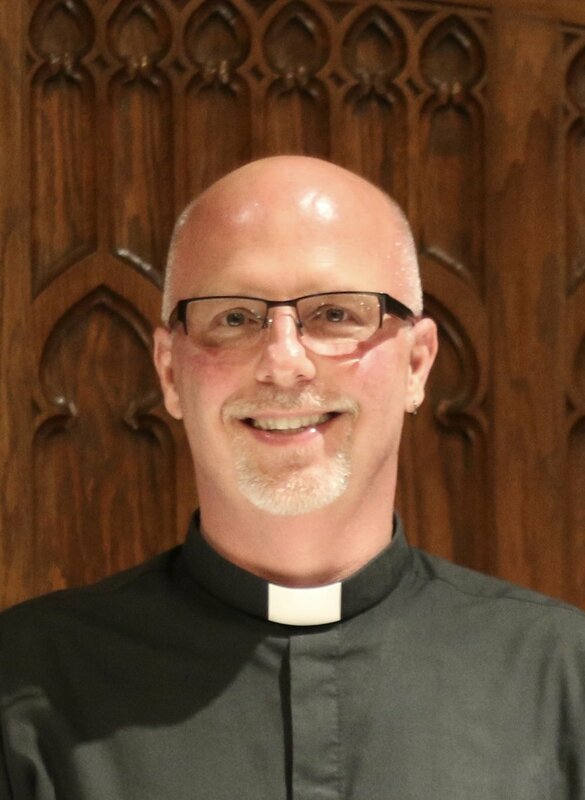 Deacon Jim received his Master of Theology degree from Fuller Theological Seminary in Pasadena and his Doctor of Ministry from Trinity School for Ministry in Ambridge, Pennsylvania. He is a graduate of the Gould School of Law at the University of Southern California and a member of the bar in California and Missouri. During the week he serves as general counsel and an equity partner in a real estate investment firm in Los Angeles. He also possesses a Doctorate in Bioethics from the University of Loyola – Chicago, Stritch School of Medicine and has worked in the field of clinical bioethics. Since 2007 he has been employed as a Lecturer by the California State University – Northridge in the Department of Health Sciences. In 2014 he married his wife Shira in a ceremony officiated by Shira’s father at Christ Church Jerusalem. Shira’s father David Pileggi is the Rector of Christ Church. Shira was born and lived her entire life in Israel until relocating to the United States after her wedding. Shira is also a graduate of Fuller Theological Seminary with a Master of Science Degree in Marriage and Family Therapy. She currently is engaged in private practice and volunteers at a shelter for battered and abused women and children in Echo Park. Although he was born in Odessa, TX, John has lived most of his life in the Los Angeles area. John received his B.S. in Visual Art from Biola University in 2003. During his time at Biola, John was drawn to working with the Jr. High Ministry of his church and began a lifelong love for Art, Theology, and Ministry. John married his wife Dorothy in 2003. They have three children: Lilian, Clementine, and Solomon. John received his MFA in Visual Art from Vermont College in 2006. He worked as a sculpture professor at Biola University for 8 years until he was called to return to ministry in the local church. In 2013, John was asked to serve as the Director of Youth and Children’s Ministries at All Saints Church. While no longer teaching as an artist, John finds many opportunities in church ministry to draw on his art background. As the Director of Youth and Children’s Ministries at All Saints Church, John works with the leadership of the church to develop, implement, and lead programs for youth and children that build community and make disciples who know and follow Jesus. John delights in the opportunity this role gives him to think creatively about many aspects of the ministry of All Saints Church to the community. Particularly, John enjoys creatively examining established traditions, the historic Liturgical Calendar, and current programs. He looks for ways to shape intergenerational events and ministry models that extend from these historic roots and that maximize the existing skills and resources within All Saints Church. John believes that this kind of thinking is key to achieving a church life that is authentic, sustainable, and effective at both discipleship and evangelism. Arend Jessrun was born in Clovis, CA and was raised in the Sierra Nevada, the Caribbean, Florida, and Rancho Cucamonga, CA before his family returned to Clovis. Arend began playing music at age 11 on his grandfather’s clarinet and the following year took up guitar and choir. In high school, he began volunteering on the worship team and there found joy in helping others worship. He received his Bachelor of Music in Vocal Performance at California State University, Long Beach in 2015. Here at All Saints, Arend leads the congregation in song and directs the choir and band. Arend also has a passion for songwriting and loves to write music for worship. Sarah began playing piano at the age of 4 and started taking organ lessons in high school. She continued playing throughout high school and college and found music foundational for exploring and growing in goodness, truth, and beauty. Sarah graduated from Biola University and the Torrey Honors Institute in 2016 with a Bachelor of Nursing. She currently works as a Registered Nurse in Los Angeles and lives in La Mirada with her cat, Sophie. She also serves as the Music Director at Anglican Church of the Epiphany and is deeply thankful for the instrumental roles that music and church continue to play in her life and faith. Andy is currently a Lt Col in the Air Force stationed at Los Angeles AFB and is pursuing a Master of Divinity at Fuller Theological Seminary and a Diploma of Anglican Studies at Trinity School for Ministry. He is also going through discernment for priesthood ordination at All Saints. Andy was born into an Air Force family who subsequently became missionaries, giving him the opportunity to spend much of his childhood in France and the Middle East. He received a Bachelor’s of Science in Chemical Engineering from the Pennsylvania State University in 2000 when he also got commissioned into the Air Force. He has since served as an acquisitions officer and has been assigned to bases in Ohio, northern California, Utah, Virginia, and Kansas before coming to Los Angeles. He has also deployed to Iraq twice. During his Air Force career, he received a Masters of Business Administration from San Jose State and graduated from the Army’s Command and General Staff College in Ft Leavenworth, KS. He met his wife, Jen, in undergrad, and they have 3 very energetic boys. He has a tremendous passion for theology and history, and was drawn into Anglicanism due his love of Anglican writers like NT Wright and CS Lewis who were instrumental in forming his faith. Ruth was born and raised in Southern California. She received her received her M.A. in Intercultural Communications with an emphasis in ethnomusicology at Wheaton College Graduate School, and studied linguistics with SIL International. She served with Wycliffe Bible Translators for a number of years, both in their home office and overseas. She started working at All Saints in late 1999. Ruth and her husband, Wayne, enjoy the symphony and opera, traveling, and hiking and backpacking in God’s beautiful creation. Dawn was born in Aurora, Illinois and raised in Florida and Georgia. After graduating, she moved to Atlanta. While attending the Atlanta Vineyard Church, she there met and married Scott in 1999. She and Scott moved to London, England and planted a Vineyard Church in 2000. Their daughter was born in England. After 5 years, they sensed God calling them back to the States. Their journey has brought them into the Anglican tradition and eventually to All Saints Cathedral in Long Beach, CA. There’s so much more to the story but you’ll have to hear more about it over a cup of coffee or a meal. Dawn loves the opportunity to share with others what God has done in her life. Dawn has extensive experience in administrative support and loves putting her gifts and talents to use serving her Parish as the Office Assistant, supporting the Parish Administrator. Randi was born in Hood River, OR and raised locally in Long Beach and Rossmoor. She moved to San Diego to attend college but returned to the Long Beach area a few years after graduating with a BS in Business Administration. She met her husband, David, through a mutual friend and they were married in 1987. Their first home was in Belmont Heights, several blocks from All Saints’. One Sunday in 1990, in an attempt to further integrate themselves into the community, they attended All Saints’ Church. It was here that Randi accepted Christ as her savior. Marjorie was born and raised in Southern California. She received her BA in History from Biola University and her MA in Theology and the Arts from King's College, London, and is currently pursuing her Montessori Early Childhood credential at UCI. Marjorie oversees the week-to-week running of the nursery and preschool areas at All Saints Cathedral. She loves exploring the basics of biblical truths alongside the youngest members. Besides her role at All Saints, Marjorie currently works as an assistant teacher at St. Matthew's Montessori where she teaches the school’s Bible curriculum to groups of 2-6 year olds alongside the many other roles preschool teachers hold. When not teaching or studying, Marjorie loves to read, knit, listen to music, and spend time with friends and family.